Kitchen back splashes and bathtub surrounds using glass and tile. Today is a great time to be redoing your kitchen and bath because of all the options that are available to you. People use a variety of styles and colors of tile and glass when designing their kitchens and bathrooms. Your imagination and creativity is leading the way in what can be done. Tile and glass kitchen back splashes have come a long way in the last 15 years in terms of design. Glass has lots of versatility and color and is the most popular item being sold for your kitchen and bath highlights. 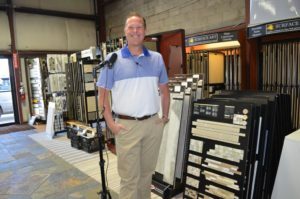 You can come to any showroom, like ours, for ideas to remodel your kitchen or bathroom. Porcelain tile is the most versatile and cost effective of the tiles. The color goes all the way through porcelain tile so if it is chipped you cannot tell. The cost of the tile is primarily the labor as the cost of the tile is usually $2 to $6 a foot and the labor will double your cost unless you can do it yourself.